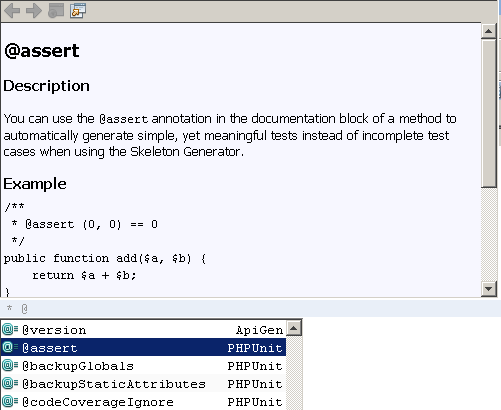 NetBeans IDE for PHP supports PHPUnit automated tests. Thanks to PHPUnit, NetBeans IDE provides code coverage for PHP, similar to the code coverage the IDE provides for Python. Test output appears in the same feature-rich output window that the IDE’s JUnit and Python test runners use. 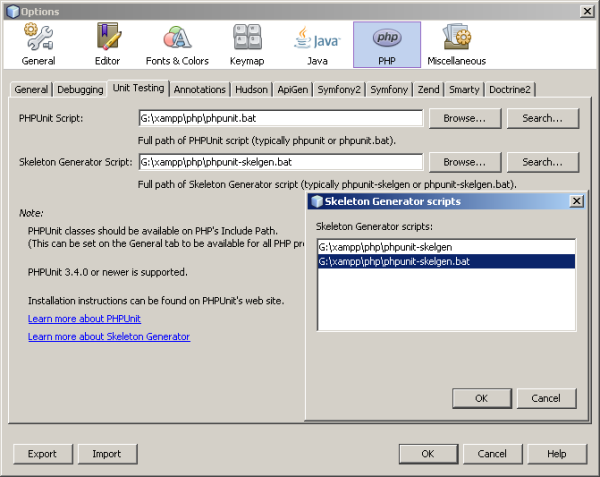 NetBeans IDE also supports the Selenium portable test framework, in combination with PHPUnit. A Selenium plug-in is available from the Update Center. Installing this plugin adds a Selenium server to the IDE’s registered servers and adds Selenium test options to the PHP menus. Use PEAR to install PHPUnit as described in the PHPUnit documentation and PHPUnit’s Skeleton Generator as described in the Skeleton Generator documentation. Install PHPUnit version 3.4.0 or later. No special setup is needed. After PHPUnit is installed, NetBeans can recognize it. Note that you need to have PEAR installed with your PHP engine. Also note that PHPUnit documentation says PHPUnit is usually installed to the local PEAR directory. They give a path of /usr/lib/php/PHPUnit , but on XAMPP for Windows it is XAMPP_HOME\php\PEAR\PHPUnit . Create a PHP project named Calculator. In this project, create a file named calculator.php . 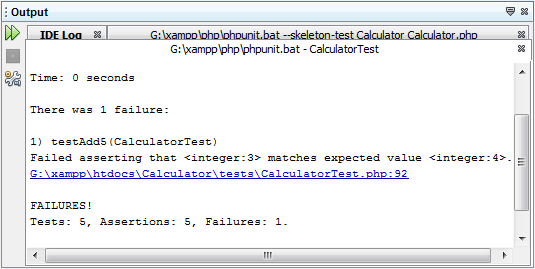 In this file, type or paste the Calculator class from the Skeleton Generator chapter of the PHPUnit documentation. *Note: *You can use annotation code completion to add @assert annotations. Navigate between parameters with the Tab key, or click Enter after filling in a parameter value. You can manually write multiple tests for a project. If you write multiple tests, you can sort them into subfolders of the test file directory, such as "important" or "quick." 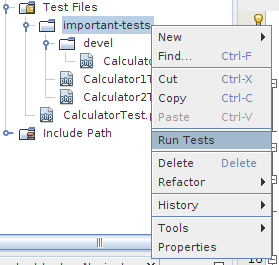 You can then run tests in a subfolder by right-clicking that folder and selecting Run Tests. To mark a test as part of a test group, annotate the test method with @group [group name] . 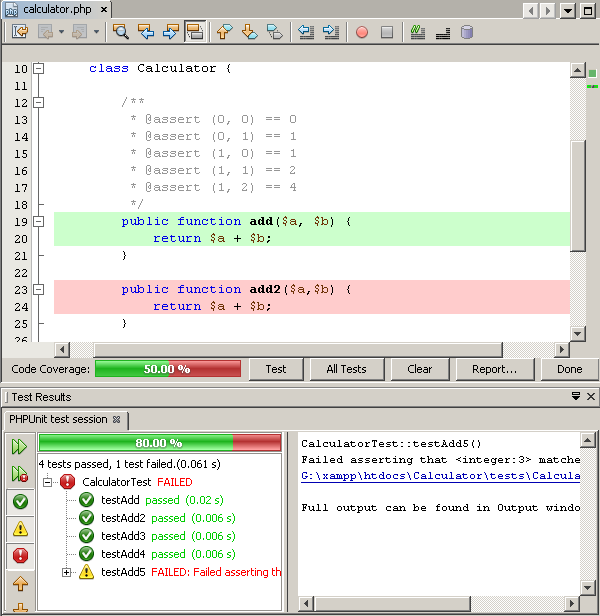 The results of PHPUnit tests are displayed in two of the IDE’s windows, Test Results and Output. The Test Results window has a graphic pane and a short text pane. The Output window gives a more verbose textual version of the output. In this section, you explore the Test Results and Output windows in detail. *Warning: *If you re-generate the test files AFTER adding the add2 function, the PHPUnit tests will not run. This is because PHPUnit creates two conflicting testAdd2 functions. Do not differentiate functions by appending numbers at the end if you plan to use PHPUnit on more than one such function. See the the PHPUnit documentation. Open a command prompt and run the command pear install Testing_Selenium-beta . You need PHP_HOME/php/PEAR on your Path. If the command is successful, the prompt will display install ok: channel://pear.php.net/Testing_Selenium-0.4.3 . The Run Selenium Tests item is now added to the project’s context menu. Click this item, and the Selenium test results display in the Test Results window, the same as PHPUnit tests.